WHAT CAUSES MY SHINGLE ROOF TO DISCOLOR AND BECOME STAINED? The most common roof stains. These stains appear black or dark grey, and tend to “run down” the roof. The spores come from our surroundings, and may have even come from a neighbor’s roof. They generally appear on one side (north) of the roof due to sun exposure. These stains only get worse over time since they are actually “growing” on the shingle surface. While the most common, and generally the most unattractive of stains, SparkleWash® can easily remove them with our patented roof cleaning products and methods. Mold and mildew appear as green and black stains on your roof. They generally indicate you have very little sun exposure on the affected areas. Like the black algae, these stains are airborne and will grow worse over time. SparkleWash® can safely remove these stains without damaging your shingles. Lichens appear as raised green circles (usually dollar size) on your roof. These stains usually come from an overhanging tree, and can spread at a fairly rapid pace. Lichens are a much more serious problem than the aforementioned stains. As they grow, they dig themselves into the granules of the shingle, therefore doing serious damage. The sooner they are removed the better. Removing lichens is a delicate and time consuming process, and some shingle damage may have already been done. SparkleWash® can remove lichens without causing any further shingle damage. Moss grows under overhanging trees and appears as a raised “green carpet”. Like lichens, moss is a more serious problem. As it grows, it breaks the granules from your shingles loose. The longer moss has been on your roof, the greater the chance some shingle damage has already occurred. Moss has to be delicately removed, taking a great deal of effort and time. SparkleWash® can remove the moss without damaging the shingle any further. The answer is quite simple, to save money. 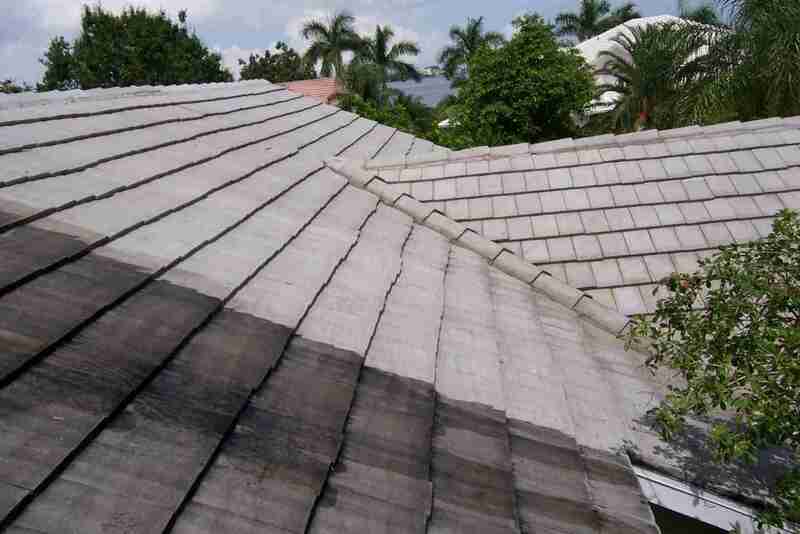 Not only are roof stains a cosmetic problem, they can seriously shorten the life of your roof. As fungus and other stains grow on your roof, it eats away the base of the shingle as it expands and contracts with the outside temperatures. This growth and movement loosens the protective granules of your shingles. Furthermore, fungus and algae covered roofs absorb more of the suns heat, making under-the-roof temperatures higher than normal. The extra heat causes a host of problems not only for your roof but your air conditioning expenses as well. Lastly, cleaning your roof will restore it’s curb appeal and resale value. 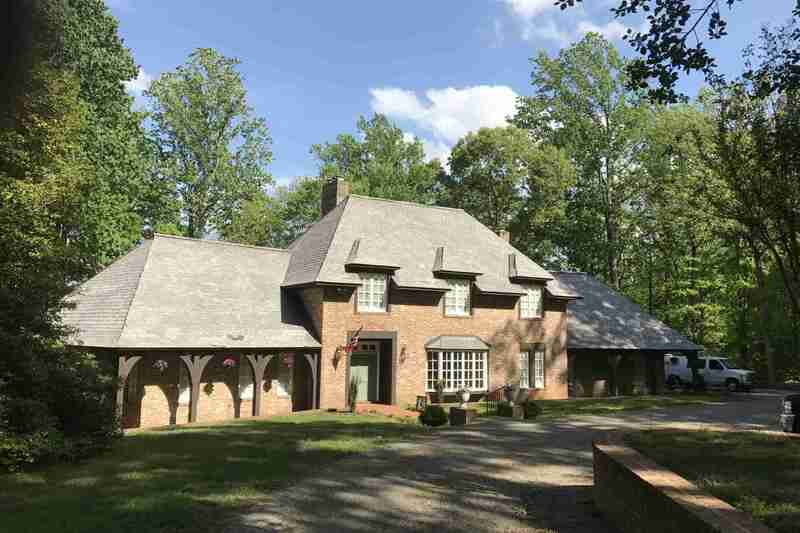 WHY USE SPARKLEWASH OF CENTRAL VA TO CLEAN YOUR ROOF? Most of our roof cleaning competitors are using industrial bleach on their customers roofs. It’s true, in the short term, bleach can kill some of the algae and fungus on your roof, but at a cost. Bleach or chlorine will dry out and crack your shingles. Aggressive soaps attack the petroleum products used to make your shingles. The combination of the two can shorten your shingles’ useful life more than the stains themselves. SparkleWash® will clean your roof using our proprietary Shingle Shampoo that contains no lye or bleach. Our Shingle Shampoo is 100% biodegradable and will not harm your pets, grass, plants, and shrubberies. In addition, our methods include a preventive treatment that has longer lasting effects than just bleach. SparkleWash® uses only low pressure methods and techniques on your roof. We will not damage your roof with excessive water pressure. Our use of low water pressure may take us longer, but your roof will not suffer the sometimes disastrous consequences from using a cheap, inexperienced “pressure wash” competitor. SparkleWash® gives a three year “clean roof” warranty. If your roof stains return within three years, we will clean them for free. No questions asked, and no small print! We can only offer this warranty due to the time- tested thoroughness of our Shingle Shampoo and our roof cleaning method. And, don’t worry SparkleWash® will be around those 3 years. Our roof cleaning results are immediate. No waiting around, hoping the stains diminish over time. And, on top of our three year “clean roof” warranty, we offer a 100% satisfaction guarantee. WHAT ABOUT THE ROOF CLEANING COMPETITION? SparkleWash® of Central Virginia does not generally talk about, or respond to the competition. For the most part, they come and go, and customers can make their own choices and decisions. However, the roof cleaning competition is making outrageous and possibly very damaging statements and claims, that must be addressed. Almost all of our roof cleaning competition is using industrial grade bleach and TSP (degreaser) to clean roofs. If you use a competitor, you will smell an intense bleach odor around your house while the work is being performed. The amount of bleach (chlorine), and in the dilution they are using, will dry and crack your shingles, damage the finish on your gutters, and may harm your surrounding plantings. We’ve witnessed the long term effects of their cleaning methods first hand, and it’s extremely detrimental to a asphalt shingled roof. They even claim to be endorsed by major shingle manufacturers and roofing organizations. The question you have to ask yourself is “what do shingle manufacturers want?”. They want to sell more shingles. Shortening the life of your shingles, makes them more money. So, buyer beware! SparkleWash® of Central Virginia never uses bleach or high pressure to clean a shingle roof, so no long term damage will ever occur.